PHOTO B: Mark and trim the angled ends of the strips on the table saw with workpieces supported by the miter gauge set to a 45° angle. 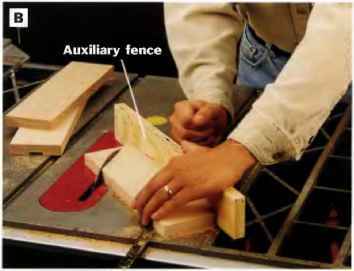 Attach a piece of scrap to the miter gauge to serve as an auxiliary fence. Doing so provides better workplece support and control. 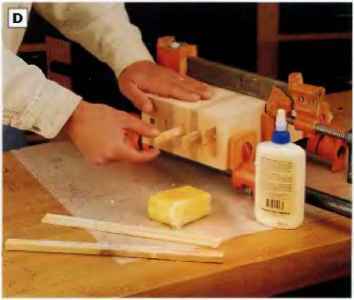 PHOTO A: Cut the knife slots Into one face of the strips using a dado blade on the table saw las shown), or on a router table with a straight bit and fence. O Plane all of the % beech stock down to Va in. thick. Beech is an excellent choice for this project, as its Light grain will resist warping. Choose quartersawn stock if possible, which is less likely to expand and contract dramatically in response to changes in humidity Be sore the faces of the stock are flat. © Rip stock for the strips to width. Make these rip cuts on the table saw with the blade set to 3Yi in., then flatten and smooth the cut edges on the jointer. 0 Crosscut 10 strips to length. 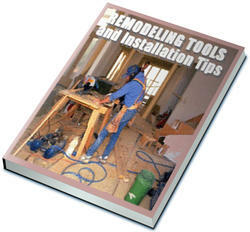 Lay out the groove locations on the strips using the End View Block Laminations drawing on page 253 as a guide. The widths and depths of these dado cuts will vary, depending on the dimensions of your knife blades. O Mill grooves into the strips. 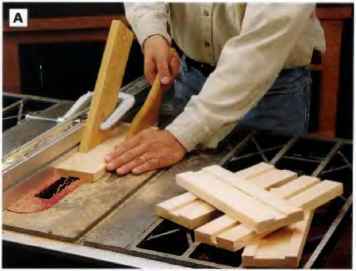 Make these cuts with either a dado head in your table saw or a straight bit and fence on a router table (See Photo A). If you want to include a hole for holding a sharpening rod, cut a square groove for it now, along with the rest of the knife slots. 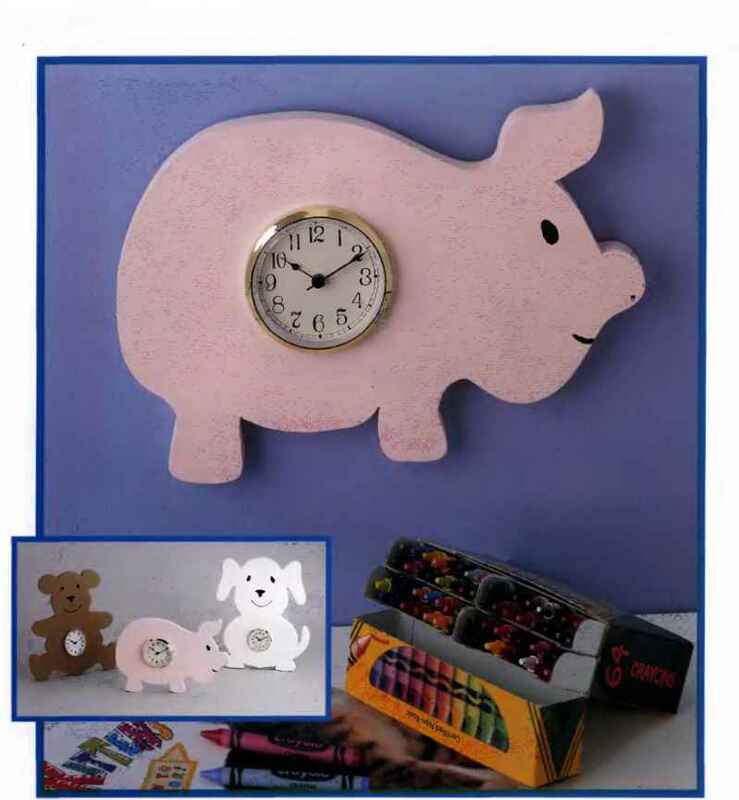 0 Lay out and cut the angled ends on each of the strips, according to the dimensions given on the Side View Block Laminations drawing, page 253. Cut these angles on the table saw with the miter gauge set to 45" (See Photo B). Cut away the larger angled portion first, then reset the miter gauge to 45D in the opposite direction to nibble away the smaller angle. 0 Lay out and cut the two feet to shape: Cut blanks for the feet to 8 in. long and 5 in. wide, with the grain running lengthwise. Draw a 1 x 1-in. grid onto one workpiece, and draw the Side View Feci profile shown on page 253 onto the blank. 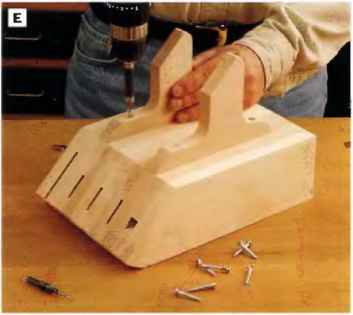 Trim this leg to shape on a band saw, scroll saw or with a jig saw (See Photo C). Use the leg as a pattern for tracing the profile onto the second leg blank, and cut it to shape. Then clamp the legs together and gang-sand them on the drum sander so they match. 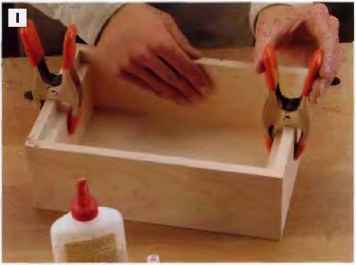 O Keeping glue out of the knife grooves will be your biggest challenge when gluing up so many strips at once. Here's a solution to help remedy the problem: Cut strips of Vfe-in. thick scrap wood to fill each knife slot dado. Make these pieces fit snugly but not tightly. They should be able to slide easily into and out of the dadoes when the block is clamped together. Coat each filler strip with paraffin wax to repel glue. 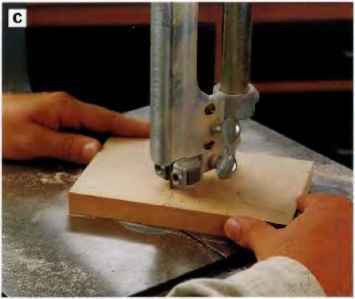 PHOTO C: Lay out and cut one foot to shape on the band saw. Use this work piece as a template for drawing and cutting the second leg to shapes Then clamp the legs together and sand both smooth at one time. O Dry-fit the 10 strips together and temporarily clamp theifl. Check to be sure that all the knives fit into their grooves. They should be loose enough to facilitate easy removal, yet snug enough so the fit isn't sloppy You may even want to mark the config-u ration of the strips .so they'll be easy to organize once you start the gluing process. O Glue and clamp the strips together. First, spread an even coat of glue onto both faces of tile inner 8 strips and on the inside face of the two outside strips. Then set the waxed filler strips into the knife slots. Note: Apply a thin, even coaling of glue. The strips will be more likely to slip out of alignment when you clamp them if the glue is too thick, because it will act like a lubricant. Assemble the block laminations into a block. Alternate bar or pipe clamps above and below the block to distribute clamping pressure evenly, and gradually tighten the clamps until the joints between the laminations just close. Tap the workpieces with a mallet, if necessary, to keep the edges and end.s even. Wipe up glue squeeze-out with a wet nig, and remove the filler strips before the glue has a chance to set to keep the strips from sticking (See Photo D). (J) Sand the block thoroughly after the glue has dried to remove all traces of exeeaa glue, working your way up to 220-grit paper. PHOTO D: After your clamps have squeezed the excess glue from the assembly, but before the glue starts to set, remove the wax-coated filler strips In the knife slots. Once the glue dries, sand the block smooth. (D Install the legs on the block; Drive 1 V4-in. flat-head wood screws through countersunk pilot holes in the log.s and into the block to attach the parts. Align the parts so the bottom front corners of the legK are even with the bottom end of the block (See Photo E). © Seal the block with several coats of clear polyurethane varnish. Or leave the block natural if you prefer. PW0T0 E: Drive flathead wood screws through the feet and Into the bottom of the knife block. Drill countersunk pilot holes for the screws first, to make screw installation easier and to recess the screw treads.